And check out my reader’s TRAIN SET VERSION here. Isn’t it cute the way you can fold it all down and up again? 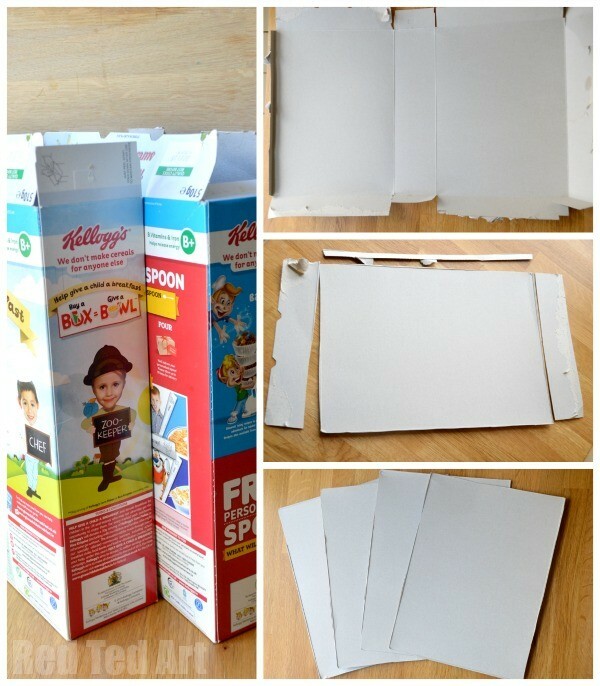 1) You will need two large cereal boxes. 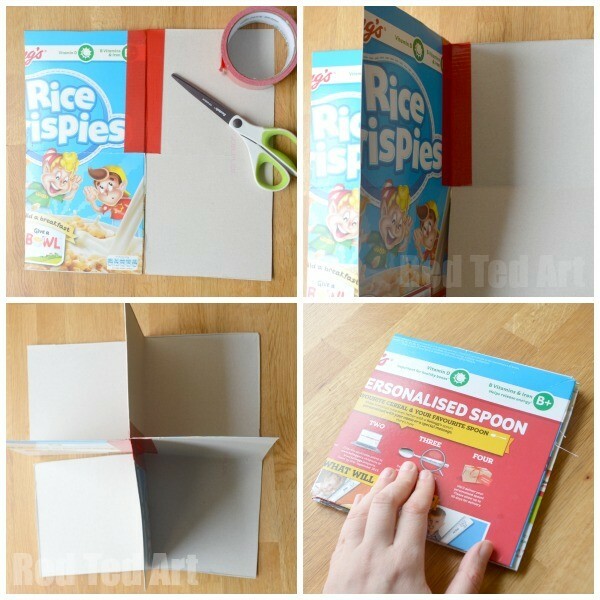 2) Unfold your cereal boxes. 3) Cut out the main panels. 4). This should leave you with four panels. 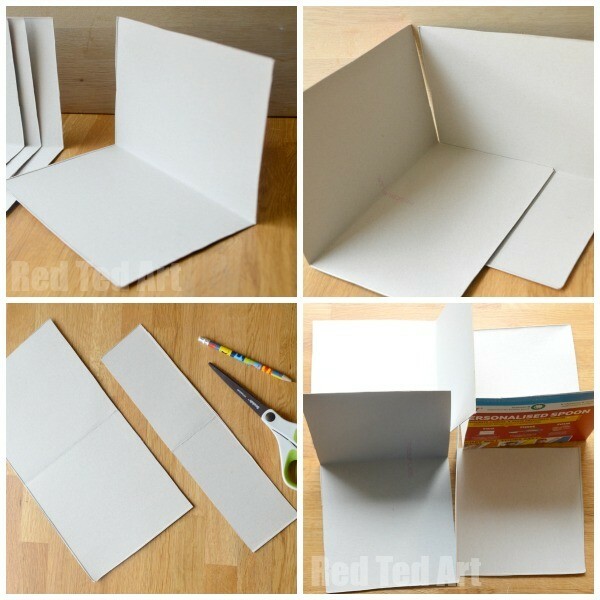 5) Fold your panels in half. 6) Now you want each half “panel” to be a perfect square”. You could get a ruler out and measure everything out, but I was lazy and I used one of the other panels to measure a square and draw a line…… measuring is better, but I am a messy crafter!!! (top right hand corner). 7) Once you have your lines, cut off the excess sides. This should leave you with a piece made up of two squares. 8) Repeat with the other 3 pieces. They now all fit together as per the bottom right hand corner. Arranging them can be a little muddling… but if you follow the next steps, it all falls into place…..
9) Place one panel cereal side up and one cereal side down. As per the top left picture. Tape the top HALF of your two pieces together. As mentioned before, use duct tape, as this is nice and strong and will allow for lots of folding and unfolding without tearing. Other tape works too, but just add more layers. 10) Now taped, you can flip the right hand side over…. and lay the next 3rd panel, face down next two the first two. Tape this in place again.. flip over (as per top right hand picture).. and add the forth panel. Tape in place. Now flip the 4th panel over and unfold the first panel. Connect the 1st and 4th panel. 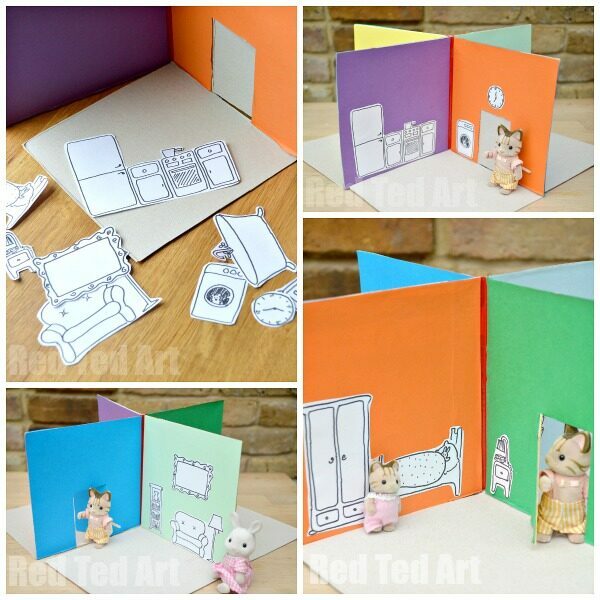 11) When you unfold it all you can will get a 3d room layout (bottom left). 12) When you fold it all up again, you get one neat little package (bottom right or watch the video below). 13) Now it is time to cut some doors into your house. We went for two doors only – on opposite sides. This leaves more space for “adding furniture later”. But you can 4 doors if you wish. Unfold your house but lay flat. Measure the door size, based on the toys you will play with. Cut the door into the TOP HALF of one panel using a stanly knife. 14) Repeat on opposite side. Time to decorate!!! We decide to leave the floors plain… and to decorate the falls only. 15) Being a lazy crafter (as per usual), I didn’t measure out exact shapes…. It was much easier to simply apply glue stick glue to one square panel. Then press the coloured paper down onto it. 16) I flipped it over… and using scissors, cut around the edges of the square. 17) If necessary cut out a door and stick that down too. 18) One panel finished. All neat and tidy, with no precise measuring needed! 19) Repeat for all the sides… and cut out doors where necessary! 20) Now you can start adding some furniture! You can either design your own.. or use the templates I have provided above…. you can leave them black and white or colour them in.. your call! 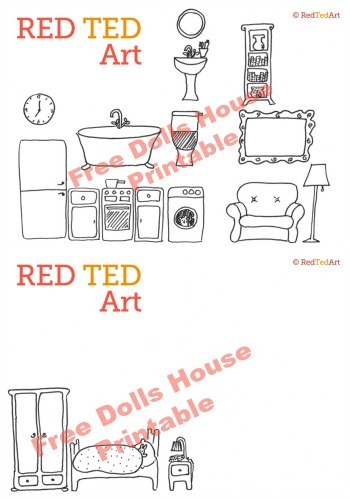 I have left plenty of space to let you add more furniture items… So.. print/ draw and cut out. 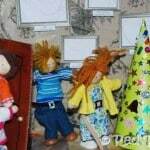 21) Using a glue stick, stick your dolls house furniture into place. 22) You are finished with your cereal box doll house and ready to play!!!!!!!!! And once you are done, pack your dolls house up, pop it in your back.. and off you go. 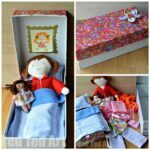 Great DIY doll’s house. Thank you for the awesome tutorial. Without “??? ?” I was trying an emoticon! It would have been nice to have your instructions in printer format. When I printed the pictures, I wasted a LOT of black ink and could not edit the pictures at all. This is adorable!!! 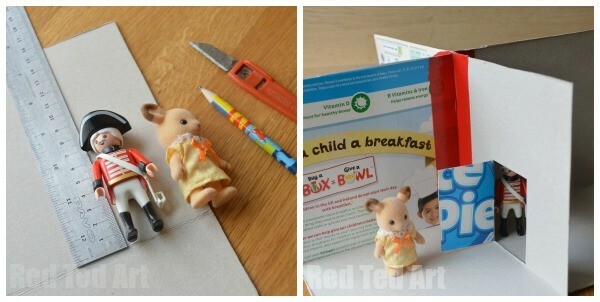 My girls are so excited to make one of these for their little Calico Critters. We loved making these today. See my blog post for the pictures of the finished product. DD loved it! We had so much fun making these today. Check out the pics of the finished product on my blog post. DD loves it! Oh I couldn’t get onto your site? Would love to see the pictures! I am in love with this project!!! Made it as a surprise for my daughter and planning to share it with her on an upcoming flight. Just brilliant!!! I wrote a blogpost about it and linked to your site as well as the project. I hope that’s okay! Your site is so amazing!! Thank you so much for the wonderful ideas. Oh my, yours turned out sooo lovely!! Am so pleased! Thank you for sharing your photos! 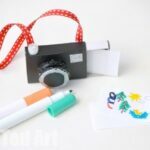 I just made this with my 3- and 5-year-old boys and they are enjoying it as we speak! 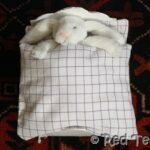 So cute and simple, and I love that it’s constructed with readily-available recycled products! Oh that is so lovely to hear!! We just finished ours using old maps, recycled book pages, and a construction paper city we built! 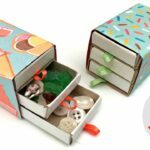 We added ribbon to two pieces as a way to keep it closed when folded and string to the sides and bottom to be tied when open. We also used adhesive craft ribbon around the edges for a nice finishing touch. 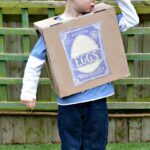 Thank you for this… my son LOVES it! Awww so pleased to hear! I just made this dollhouse with my 3 and half year old while the baby napped. She LOVES it! We made the doors tall enough for a magic clip disney princess to fit through. She has been playing with it nonstop for the last hour. Thank you for a wonderful mommy/daughter craft and fun doll house to play with! 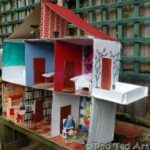 I just made my first foldable dollhouse. It was fun and easy. I plan to give it away tomorrow. 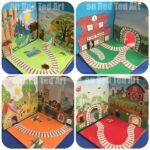 Now I would like to do the train set foldable. Do you have printouts for the train (i.e. tracks, tunnel, etc.)? I would love to try to make of those too! In the photos they are “Sylvannian Family” characters. I think somewhere I showed a “Sunny Angel” Doll too? Is that the one you mean? Awww glad you like it! Thank you so much! I’m from Argentina and I love all these cute ideas. Thank you so much! 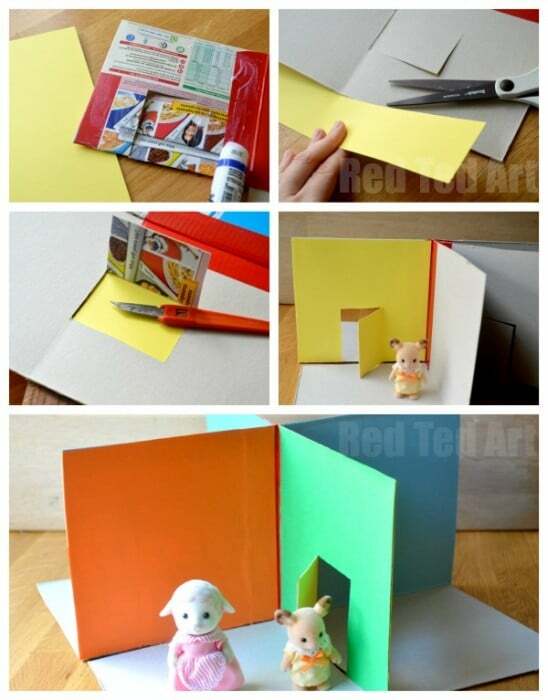 I love these cute ideas for my kids.